Department of Art | FSU Art Student Mari Kyle Featured on FSU Profile! Home » News » FSU Art Student Mari Kyle Featured on FSU Profile! 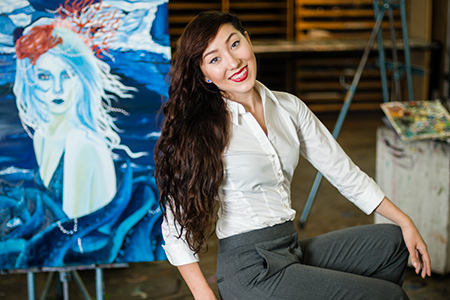 FSU Art Student Mari Kyle Featured on FSU Profile! There are a wealth of reasons why senior Mari Kyle chose to attend Florida State University — the academic programs, the beautiful campus and the plethora of opportunities that are available to students. However, there is one reason that made Florida State the obvious choice — the sense of belonging. As part of the Undergraduate Research Opportunities Program, Kyle participated in the Art + Feminism project that researched the acceptance of female artists in the contemporary art world. She created a list of museums that was ranked by prominence and the current count of exhibitions by female artists. This project was taken a step further when Kyle decided to direct the Women + Art Wikipedia Edit-a-thon for Florida State. This nationwide event sought to bring attention to the fact that there were very few Wikipedia entries that commemorate female contemporary artists. To read more about Mari, visit the FSU Profiles!